A trip to Hasankeyf, Turkey - Has Anyone Been To...? This trip was made back in 2008, and the only pictures I took were on a disposable camera. Apologies for the lack of quality pictures. I remember making the decision back at home in England. Should we fly in to Diyarbakir or Batman? I knew Diyarbakir was bigger, had more to see and more places to stay and eat, whereas I could find precious little information out about Batman. But Batman was closer to our final destination of Hasankeyf, we only had a few days, and frankly…I’d get to visit a city called Batman. However, as our plane descended and I saw the tank that was waiting to meet us on the airstrip of what was clearly just a military base; I began to think that maybe Diyarbakir would have been a better choice. My suspicions about flying into Batman began when we tried to book the flights in Istanbul. We went through agent after agent who all said they didn’t work with “that side of Turkey”, and one agent who denied Batman or Hasankeyf even existed. In the end, we booked online rather than face another agent incredulous we should want to go East. Most Turks see the Eastern, Asian side of their country as a vast wilderness, populated by scattered handfuls of backwards Kurds and as rather an embarrassment to their modern lifestyles in the West. As for the Kurds who live there, they believe that their culture and way of life differs so greatly from the Turks that there is no reason for them to be a part of Turkey at all. While Istanbul is a beautiful example of East meets West, on the whole it is not a happy partnership. The East is just as rich in history as the heavily touristed Western side, although the history is different, and often still living. Indeed, in Mardin you are as likely to hear Aramaic spoken as Turkish. We were heading to one piece of history in particular though- Hasankeyf. First settled over 10,000 years ago, on the banks of the Tigris, Hasankeyf has history every which way you look. It’s been home to the Romans, Byzantines, Artukids, Ayyubids, Mongols and Ottomans, as well as to the semi nomads who live there. There’s a whole city carved into the cliffs; homes, churches, mosques, reservoirs all hewn from the rock. There are also remains of bridges, churches, mosques, palaces and cemeteries dating from the 1100’s, and all in a town of just 2,500 people. With such treasures, you would think that the Turkish government would be promoting Hasankeyf around the world for tourists to come and see. In some ways, we are lucky they aren’t, as it remains small, unspoilt and peaceful, even when weekends bring local day-trippers. Sadly, however, they are not just neglecting the area, they are actively destroying it. The Ilisu Dam will be the biggest hydro electric dam in Turkey. It will generate over 1,200 MW of energy and the government believes it will bring tourists and jobs to the region. It will also displace 55,000-60,000 people and flood Hasankeyf, destroying thousands of years of history. Whether the project is deliberately malicious in its intent, as is claimed by many, is unclear, but it is certainly ill thought through and being handled with the casual brutality that is often seen between the Turkish military and the Kurds. According to the Kurdish Human Rights Project, at least 19 villages have been evacuated at gunpoint. Hardly the consultation process the international community was promised. We were here to see this marvel for ourselves before it disappears forever. As we filed off the tiny plane, armed teenagers in full military get-up herded us into a shaded pen, locked the gates and stood guard. Things weren’t looking good, but we had no idea if this was normal or not. My poor Turkish really wasn’t prepared for military negotiations. No one else seemed surprised by this turn of events, so we waited patiently, silently and hopefully. In the end, a bus turned up to carry us to the terminal building, though not before everyone’s passport had been carefully checked again. The terminal itself looked as though it should be diagnosed as such. Just one room, two benches and a luggage carousel, which showed, through the hole in the wall, the coach we had disembarked from. Above the only other door, which we were hoping was the exit, was a huge sign for the Otel Zeki. Having been unable to find any accommodation in Batman before setting off, we climbed into a taxi and asked to be taken there. Our taxi driver was a marvel. Having made sure it was the Zeki we definitely wanted, not any the hotels he was paid by, he said in perfect English “I’m sorry, I don’t really speak English. Do you speak Turkish?” We said no, having found that admitting to speaking a little only brings disappointment when you can’t understand the stream of high-speed Turkish that invariably follows. “Arabic?” No. “Kurdish?” No. “German?” No. “Oh well. I shall have to practice my English then.” And continued to converse with us without a problem. I have never felt less uneducated or more rude in my life. The Otel Zeki was utterly charming. Used to staying in cheap hostels, we were a little astounded at the marble floors and heavy wood reception. The receptionist spoke perfect English, and looked a little surprised to see foreign guests that weren’t attached to an oil company. The Otel Zeki has a grand foyer which fades the further you travel from it. Our porter somehow took the lift and left us to carry our bag up the stairs, but did wait for us at the top at least. The wing next to ours still wasn’t finished, and builders wandered back and forth along shiningly pristine corridors. In the room they had tried so hard to keep up the glory, and just missed every time. We had golden silk curtains- of different lengths, air conditioning- which fused the electrics and the walls looked to be made of marble, but someone had in fact painstakingly painted marble patterning onto plasterboard. I’m not complaining about this though, I loved the hotel and the effort it put into everything. Indeed, our receptionist rang our room after half an hour and invited us downstairs to have coffee with him so he could practice his English. “Very good thanks- and you? Twenty times a day. Everyone was delightfully polite and friendly, and while we were stared at, it wasn’t intimidating. Being not only a white westerner, but ginger as well does mean I stand out a mile in Turkey. At the Ocakbasi we ate that night, I asked if they had any cherry juice. “Of course, of course” cried the owner, before sending his waiter down the road to the shop to buy some for me. 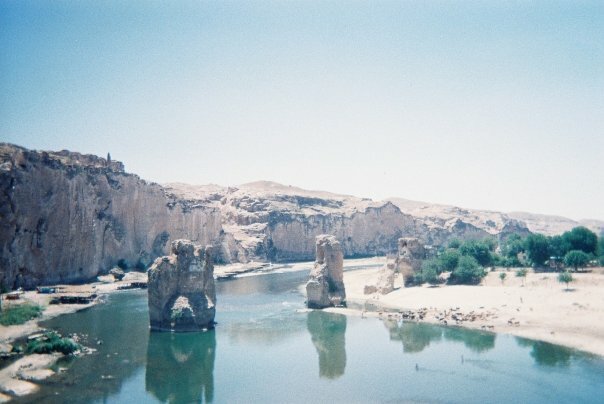 The next day we set out for Hasankeyf. We were directed to the bus station by our receptionist, who looked quite broken hearted that we turned down his offer of free breakfast. Asking our way around the bus station, we ended up at the next minibus that was going there. We climbed into the van taking the last two seats, and waited for the off. And waited. We knew that in places like this buses don’t run to timetables as such, but wait until they are full before leaving, but as we had taken the last seats we assumed we’d be leaving shortly. Then people came along with parcels to be delivered. Once the boot was full, they were handed through the bus to be held on laps. Once truly fully laden we set off. However just five minutes down the road, not even out of Batman, we stopped again and two more people got on. Children’s plastic stools were produced as if by magic and they sat in aisle of the van. It wasn’t a long journey, but it was hot, cramped and honestly a little dull. I started off fascinated by the desert landscape, the dusky orange hue that the sand imbued everything with, the solemn nodding donkeys working perpetually in sun. But the problem with an endless landscape is just that- it remains seemingly endlessly the same. And journeys are rarely improved by having a fat mans armpit in your face. But getting to Hasankeyf made it worthwhile. For a start there’s the Tigris. It was low when we were there, but it still cut an impressive blue wound across the drab yellow desert. It was so full of life, so glittery, that it seemed more skip along the valley than flow. There were cow herds watering their buffalo, women doing their washing and children cooling down and showing off. The new bridge across the Tigris at Hasankeyf is nothing more than a functional and safe road, but it offers a view into history. Looking East the whole river side is potted with ancient shelters in the rock face, while looking West shows you the ruins of the citadel on the top of riverside cliff and the remains of the Ottoman Bridge. We went first to the citadel. An entire complex of caves is present as we walk up the steep cliff in the midday sun, and they provide welcome respite from the intense heat as we duck inside regularly. You can see why cliff dwelling has been so popular and long lasting here- the drop in temperature is both instant and dramatic, yet in the winter the same caves will hold heat in. At the top the view is breathtaking, across the Tigris 100 metres below and over the valley. The ruins up here are extensive, and can easily take a day to explore, although as there’s little protection from the sun it may not be advisable. Scattered around the town are other relics of previous empires- an Ayyubidian palace and several mosques as well as Ottoman minarets and mausoleums. One tall minaret in the main part of town has a pair of storks nesting in it, leaving their haphazard bundle of sticks perched precariously over the people as they circle over the river. At the base of the cliffs, several restaurants laze through the weekdays, waiting for the Turkish tourists of the weekend. Often these are simple platforms out over the river, where you can eat from a barbeque whilst watching the water drift below you, shaded by simple grass roofs. Others have colonised the natural caves and cracks in the cliff face, and give a small taste of a modern troglodyte existence. Hasankeyf is a beautiful, unique town. One small local girl who joined us in exploring the caves along the north shore put it best: It’s not heaven, but it’s close.